I love that for the cost of 1 rose, ($5) you can provide one month (as in one bottle of life saving insulin) and save the life of a child with diabetes who is in desperate need of insulin. I know what it�s like to worry about not having enough money to pay of insulin or diabetes supplies - I�m lucky, I have insurance and a network of diabetes friends who are always there for me. But not everyone is so lucky. 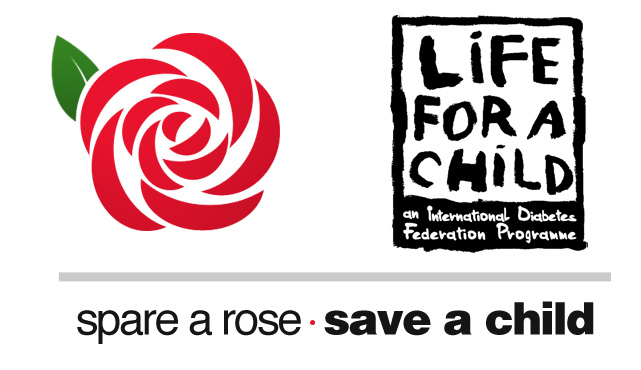 So instead of buying your loved one a dozen roses this Valentines Day, buy them 11 roses and donate $5 to SpareARose, via IDF's Life For A Child program. Your $5 donation allows Life For A Child to provide one month of insulin for a child who needs it. And now your donation will have double the impact, because The Helmsley Charitable Trust has graciously agreed to match all new donations . Your $5 donation becomes a ten dollars donation, and one insulin bottle automatically becomes two. Your $10 donation is instantly matched and becomes $20, and two bottles of insulin becomes becomes four, and so on. Your donation is tax deductible and you will be provided with card to print out to give to someone special. And if you're looking for a Valentine�s Day gift for your child�s teacher, best friend, or fellow book club members, Spare A Rose is the way to go!